The major works of our new house are still waiting for things like planning permission, and quotes from various suppliers. Oddly one issue seems to be how busy they are, since one company couldn't even come give us a quote since they are booked solid for the next 4 months! In anycase this leaves me still able to focus on the smaller jobs, and next on the list is the box room. Having turned one of our rooms into a study for my wife, the box room is mine. You might suggest that it is a little extravagant to have a study each, but my wife's study is a very personal space for her, and whilst she lets me use it to work from home, she does so grudgingly ;-) Also I have a couple of specific requirements which don't really fit well with sharing the study. In our previous place I had a very small 'workbench' setup across two bed side cabinets in the corner of our guest bedroom. literally just a sheet of mdf painted white and balanced with just enough room to get a chair at it. It was just enough to prop up an oscilloscope, a soldering iron, and some boxes of components etc. 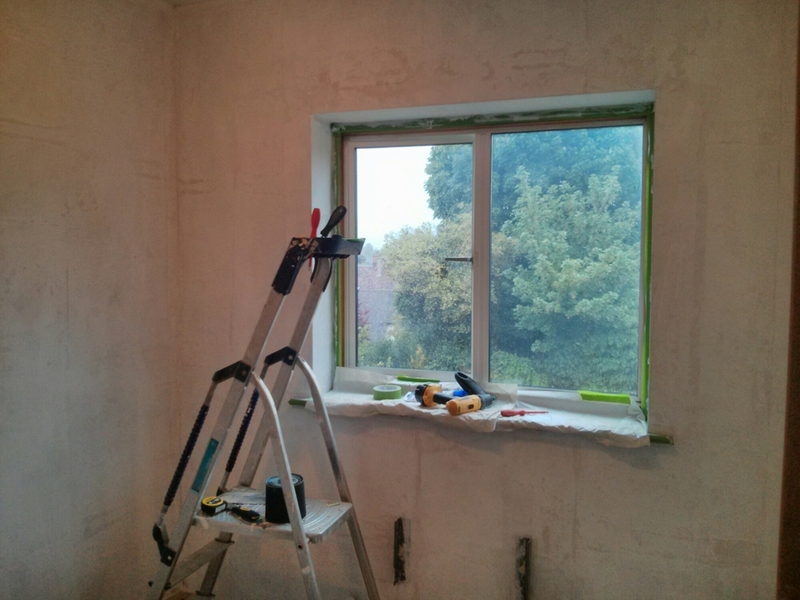 This time I have a whole box room to make my own (in addition to the garage, but that is another matter entirely) and for the sake of differentiation we're calling it the 'studio'. Mostly in reference to the fact that if I work from home it needs to be a good environment to take a video call from. Most of the work was very similar to the study. That is, stripping wallpaper, removing the radiator to decorate behind it, several coats of white paint. a feature wall, mine is a deep purple, new laminate floor to replace the old carpet. new skirting etc. I also had to add a set of blinds as this room didn't already have them. The main point that things get different is the workbench. For the study we already had a desk which has done good service. For my studio I had to decide what I wanted. 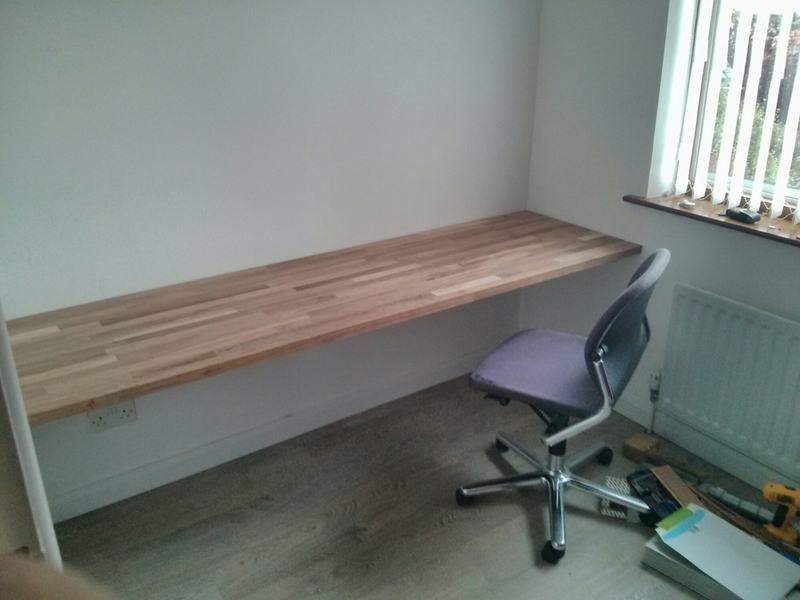 I looked at desk options, but ultimately decided that to serve as desk for home working and workstation for electronics etc, I would have a bench rather than a desk. Basically with no fixed feet/cupboard beneath it, I can sit the chair at any point along its length. 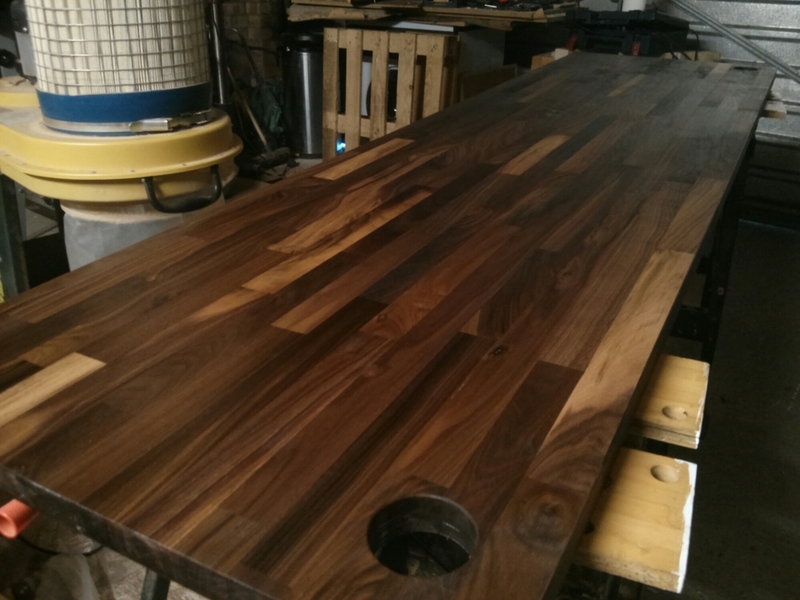 This decision meant that I could splash out a little on a nice solid walnut worktop, but not spend crazy amounts. The worktop is just mounted on some batons that run along the edges, and a single support near the front, this is what the support frame looks like. Pretty simple construction, screwed to the walls at regular intervals, arguably the 2.2 metre span could use more support in the front centre than is provided by the basic frame, but we'll see how it responds to use. mostly the heavy things will be near the corners/back, with only keyboard/trackball nearer the front. One feature is the provision of power onto the desk top without cluttering wires everywhere. For this I got myself a hole cutter as large as I could find and I cut a hole in each back corner of the workbench. Just below that point I mounted multi-way adapters. I used a hole cutter so that I could potentially use the plug to mostly refill the hole, or generally hold the wired in place. Using a hole cutter on a workbench is pretty tricky. You really need to get the plunge very straight and perpendicular to the surface, and slight deviation means that the sides of the hole cutter start to rub against the sides of the hole they're cutting. This quickly adds up to enough friction to stall the whole thing. It took me a while and several adjustments to get the cutter to plunge all the way through my worktop. I found a decent deal on 3.5 metres of work top, which was over a metre more than I needed. 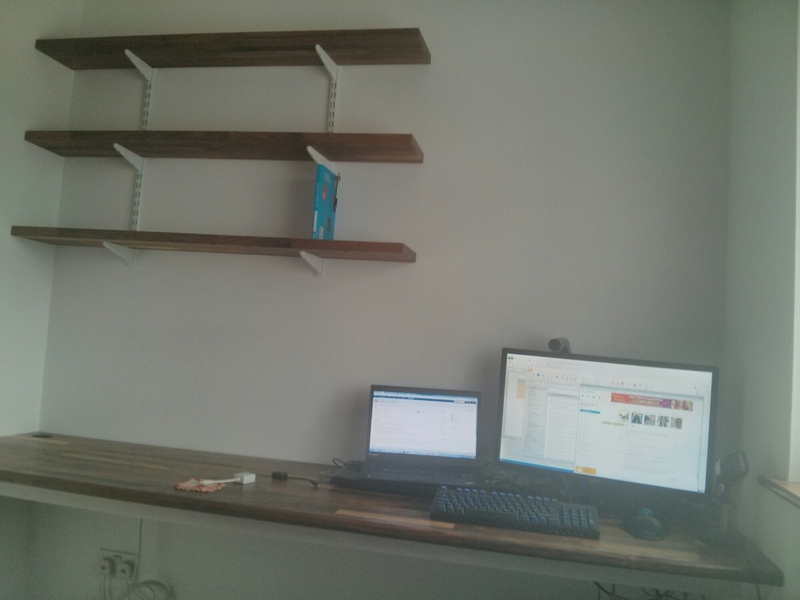 So I was able to use the remainder to make a set of three shelves above the bench. This is one of those places that a bandsaw really helps. though I guess a table saw would do the job also. Stripping >1m lengths of 38mm thick walnut is not something I'd like to try with a handsaw. Results Here are pictures of the finished room. I'm really very happy with how it has turned out. The walnut is finished with a few coats of Danish oil, this was pretty easy to apply, however I did have some trouble where I'd been moving the workbench around with hot sweaty hands, I should have used gloves or cloth to protect the bare wood, as it made it harder to get the oil to absorb evenly. I took better care when handling the shelves and it was much easier. Now I just need to unpack my random collection of stuff into the room. I'm going to have to come up with some organisation solutions to try to keep things from getting very messy. I'm not a tidy person by nature.